Most known for: Going scarcastic to evil in 2 seconds flat. 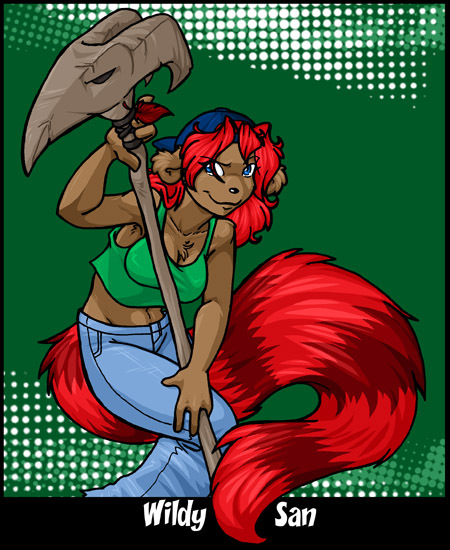 Personality:Wildy is only half the size of most characters, but she has shown to be more than capable of taking on opponents larger and stronger than her. To those who don't know her, she often appears as scheming, devious, and brutal. To those who do know her, she still appears like that but with reasons behind them. It is not uncommon for Wildy to go through strange alterations in her personality and will often appear quite friendly and cheerful the minutes before she launches into a barbed attacked. Quick wit, and quick tongue, Wildy will often say what she thinks without any real regards to tact. She is prone to causing fights on whimsy and holds grudges for quite a long time. On the flip-side, Wildy is incredibly protective of those she cares about and often has a big sister approach of "no one can mess with them but me" when it comes to others. Wildy often has many levels to her reasoning and most of what she does or says or feels has an alternate motive. It usually seems there is always some plan afoot when she is about. All in all, she's a very devious ferret. In her spare time she often plays video games and practices fighting with her shaman stick. How she actually qualified for a shaman degree is a mystery to many.